PS3 role-playing-game Tears to Tiara — which features rope play, suggestive udder spray and touching tentacles [links NSFW] — is getting an inevitable anime version. Premiering in Japan on April 2, the anime is being produced by WHITE FOX animation studio and directed by Tomoki Kobayashi (Ichigo 100%). Doko Machida (Lucky Star, Ramen Fighter Miki) is overseeing the scripts. Voice actors Toru Ohkawa, Yuko Goto and Makoto Ishii round out the cast. Besides an animated version, Tears to Tiara is also being adapted into a manga, which will first appear in the April edition of Monthly Comic Alive magazine. Animax-asia, the Sony Pictures Entertainment owned English language version of Japanese station Animax in Southeast Asia, is currently finalizing broadcast plans for the English language version of Tears to Tiara. 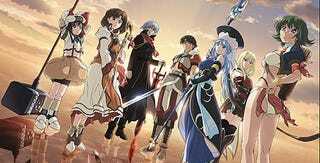 Animax-asia hopes to broadcast the English version in Singapore at the same time the Japanese version is broadcasted.